I don't think I realized how much of my time would be spent painting once I closed the brick and mortar. Thankfully, I hit the ground running and have stayed busy working on great projects with wonderful clients! I'll keep the long winded post on reserve for another day, but here are a few images of recent work, friends, and upcoming projects. THANK YOU, for sticking with me during this recent transition. I'm sure its a shocker, but I'm scatterbrained. If you've reached out about a project, hit me up again (via email) and I'll do my best to get back to you! These photos are in no order, just random work since the last blog post. I got to help Jason Pawley install some lettering for lululemon in Classen Curve above his beautiful mural. I installed some additional triangles to the 405 Yoga in Midtown. Merideth is a great client and I'm always stoked to work with them. This really added a ton of energy to the room, it's amazing how much some color can change the emotion in an area. 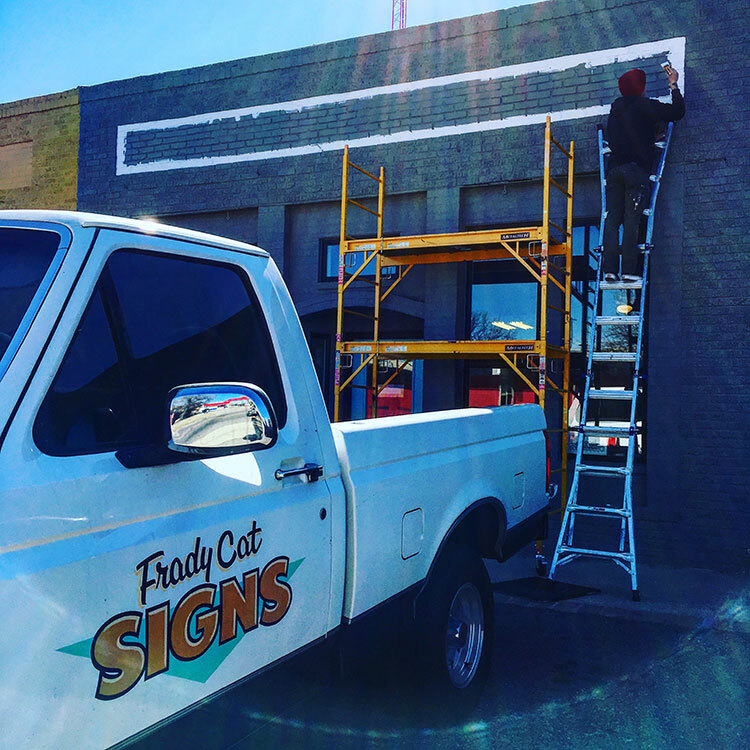 Helped my buddy, Tanner Frady, install some lettering for Oil & Clay Studio in Norman. Very classic sign gig. It's always great to paint with Tanner. He's a great friend, and one of the only persons in the world that can tolerate hours of me singing along to KOMA. 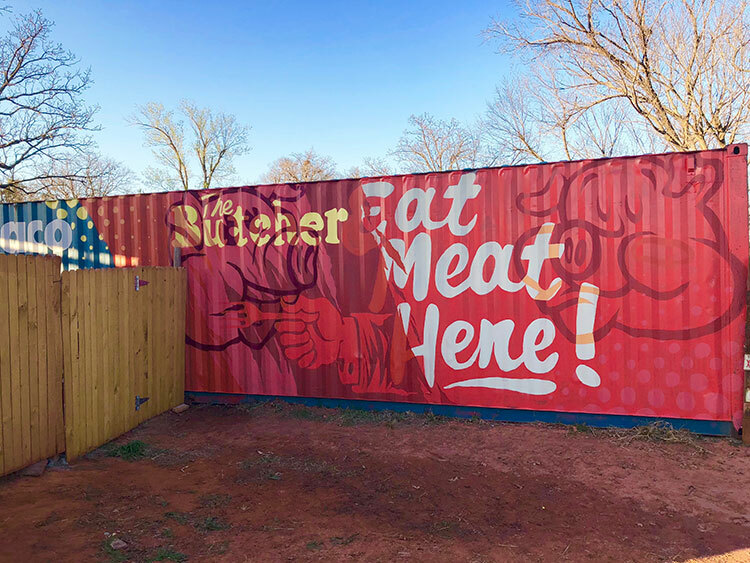 I painted a corrugated metal container for Levi at The Butcher BBQ in Wellston. Hands down, the best bar-b-que in Oklahoma. It actually snowed on me while I was painting, but ended up being a nice day. You MUST try their food, its incredible. My good friends at Bleu Garten gave me full creative freedom to design and print a shirt for their one-of-a-kind bartender, James! I got to go snap a few photos of James and turn him into a t-shirt design. I went with bright colors and funky aesthetic, because James is a wonderfully vibrant guy. Really thankful for the Bleu Garten team and their continued efforts to support local art and culture. I was asked by Luidgi at Cafe Kacao to brighten up the wall accompanying their new walk-up window. He new he wanted the word 'ALEGRÍA' and lots of bright color. This wall was 12' tall and 50' long. Another example of how color can really change the vibe of an area, this one is hard to miss! My beautiful wife, Kristen, shares a birthday with Woody Guthrie! 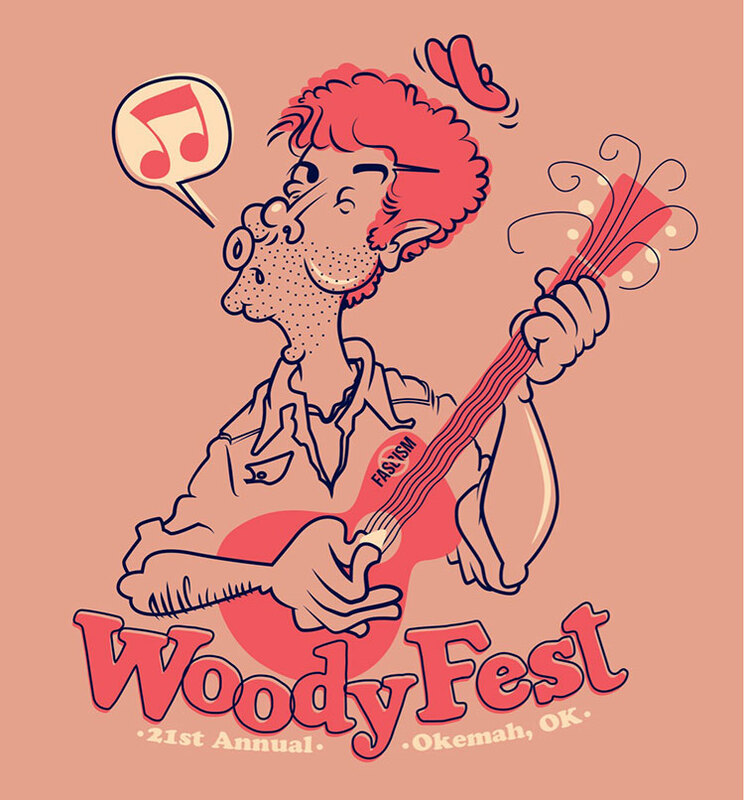 She's been wanting to visit the annual WoodyFest in Okemah, OK. She notified me that we could win tickets if I entered their t-shirt design contest. I haven't heard on whether my design won or not, but I really love the way this illustration turned out. Being a printer for 12 years has really influenced the way I design; loose registration makes this a printers dream! I submitted a painting to Fowler Auto's V-Dubs on AutoAlley art show. This 2x3 is a 1974 Volkswagen Scirocco Champagne Edition. I had no idea this car even existed until a month ago. It's basically a suped-up Rabbit and I think its hella dope. Still looking for a home for this one, so inquire about price if you're interested! Adam at Rad City needed some signage on his garage door in the alley. They provided the design and I provided the paint. I was super excited to paint along side this amazing old shipping/receiving sign. There's a new ice cream shop in town! 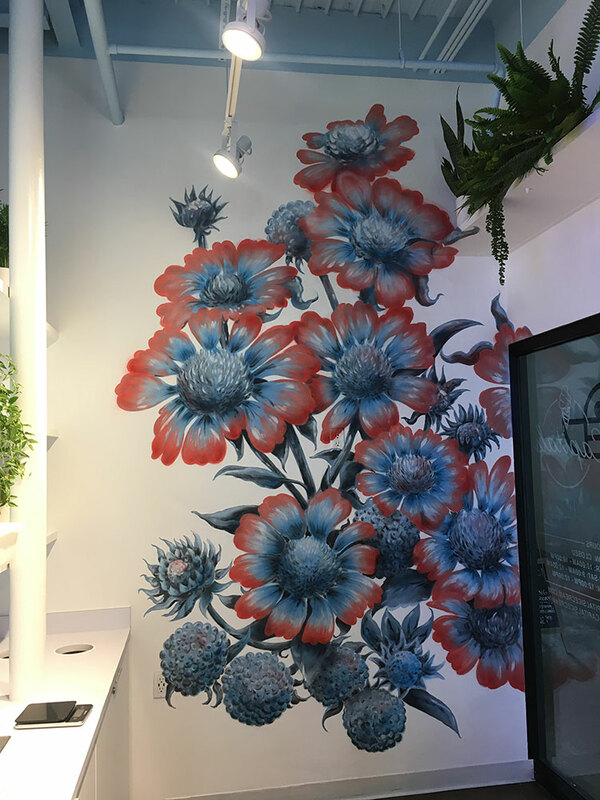 The fine gentlemen at Capitals Ice Cream asked if I could paint some flowers on the wall. This was a totally new style for me, but I'm pretty stoked on the outcome. These 12' flowers took over 20 hours to paint and we knocked it out in two days. Very glad to have Kristen Vails and Lindsay Zodrow help paint for a few hours! 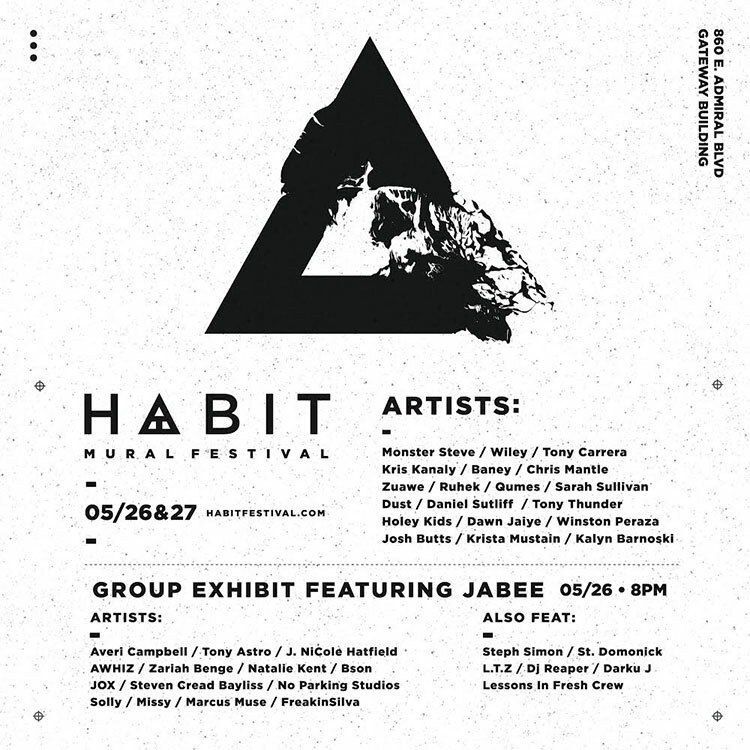 This Saturday and Sunday is HABIT Mural Festival in Tulsa! I've been drafting up images of what to paint, and I'm pretty stoked on what I have lined up. I figure this is an opportunity to paint what I want and challenge myself, so I'm going up with some big plans. Keep up on our Instagram stories and posts to see what I'm up to on the day-to-day. Late last night I had an idea I wanted to illustrate, and I'm glad I stayed up to finish it out. Totally inspired by vintage paint cans and 'wet paint' signs. I have the perfect shirt to print these on, so hopefully I'll have these ready to sell at Habit Fest this weekend. Whatever I don't sell, I'll bring back and put on the website. Thanks for looking! If you have design or paint needs, let me know. I'm booking up this year quicker than I thought I would! A big THANK YOU to all these clients for letting me be creative. Also a big thank you to Robbie Kienzle at the Oklahoma Arts Commission for being super kind and letting me submit a retroactive application for the last mural I didn't pull a permit for! See you soon!